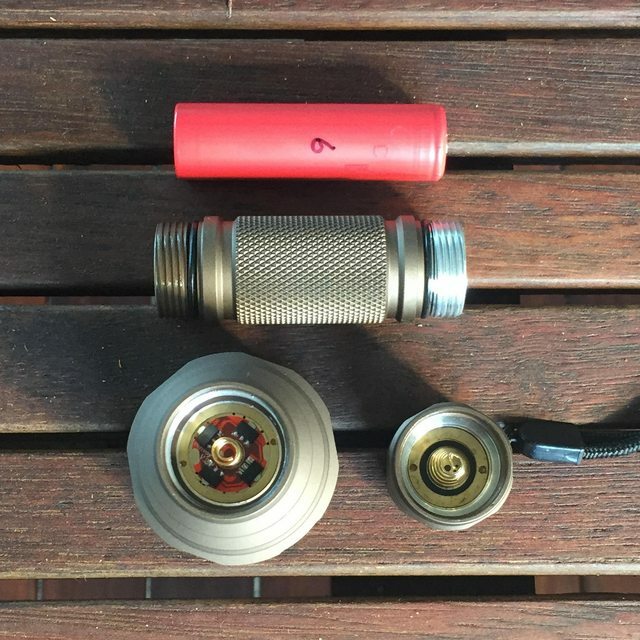 The Convoy C8 is a classic budget thrower flashlight that has been around for many years in various iterations. 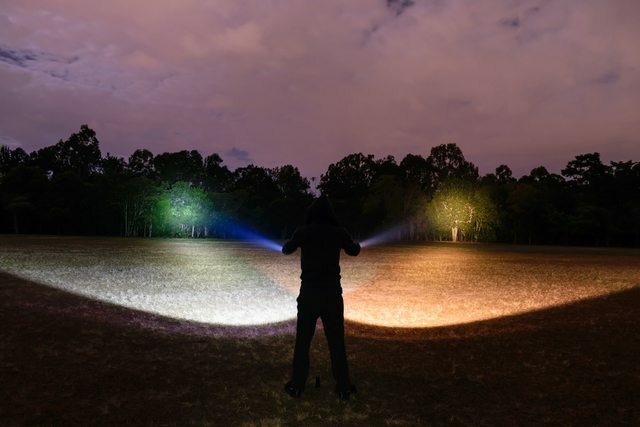 With many other manufacturers selling lights identical in appearance, it was time for Convoy to introduce a new look C8 – introducing the Convoy C8+. The Convoy C8+ was send for an honest review by Banggood. Product Link. The Convoy C8+ arrived wrapped in bubble wrap, inside a plain white cardboard box. The only included accessory was a lanyard. 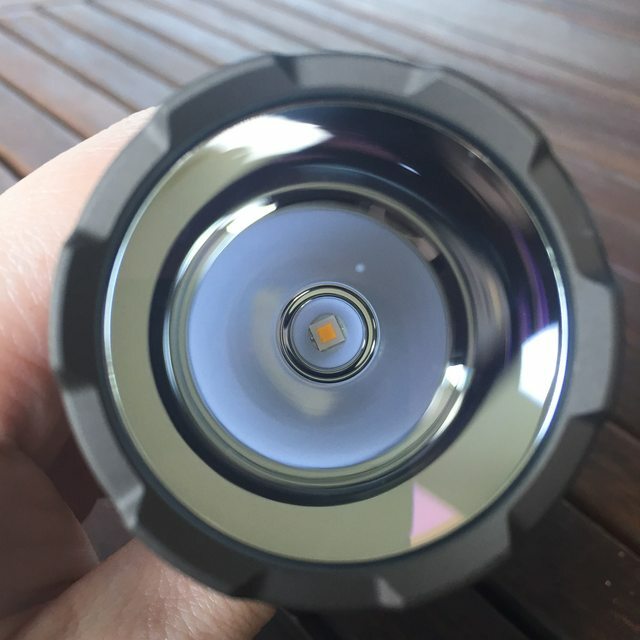 The Convoy C8+ has a similar overall profile to the C8 with a larger head than the battery tube to accommodate the smooth reflector and Cree XP-L HI LED emitter, however the addition of cooling fins on the head and tail provides a fresh new look. The fins are better for preventing roll than the older C8. The knurling on the tube is much more grippy than the C8. The Convoy logo is now below the head, rather than being along the battery tube. The C8+ is currently available in Sand / Desert Tan colour. There is no internal USB charging which is expected at this price point, but may deter some of the consumer market. Changing mode groups and turning memory on/off is fairly easy process, starting with 10 taps to enter configuration mode. I currently have mine set on mode group 2 – 0.1%, 1%, 10%, 35%, 100% with memory on. To advanced to the next mode requires a tap, rather than a full click. Memory mode (when on) works perfectly. I think Biscotti is a great user interface – very programmable, but also very easy to use. The C8+ has a two frequency strobe. As a light painting photographer I would much prefer a single frequency strobe with 50/50 on/off time. Momentary functionality is also unavailable, but that would require an additional switch or an e-switch, and thus a new design. Biscotti includes low voltage protection. When the cells are nearly discharged output steps down to moonlight output, and the light continues to run with moonlight output for a few hours. This means that user won’t be suddenly left in the dark. Eventually the low voltage protection will kick in. The cell used for testing was at a resting voltage of 2.9V after the low voltage protection kicked in. The C8+ can also be locked out by slightly unscrewing the tail cap threads. Heat at 100% power is managed quite well for such a small light. I manually stepped down after 8 minutes (in 16C ambient heat and no wind) as the head was getting too hot for my liking (I’m quite cautious). I did not notice any significant improvement in heat handling compared to the clear anodised C8 (which also has a DTP board) despite the more visible cooling fins. In cooler ambient conditions, the C8 should be able to run the light on high for considerably longer. Heat is not an issue at 50% or lower modes. 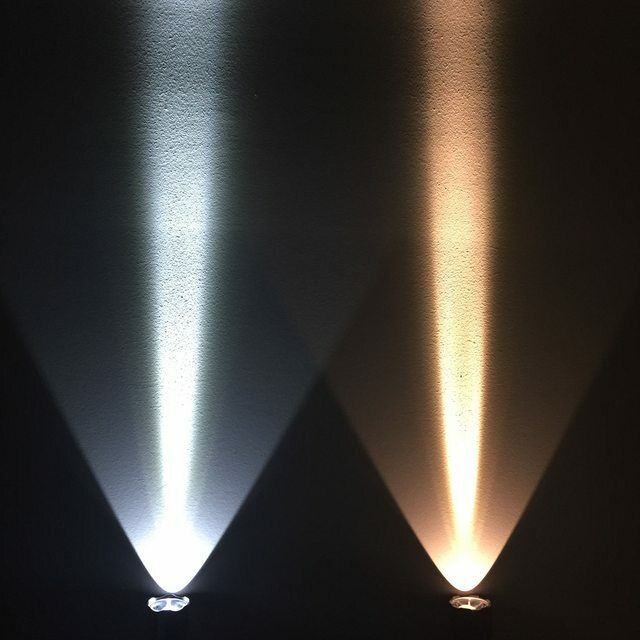 The Convoy C8+ is available with V2-1A, U6-3A, U6-4C, and U4-7A Cree XP-L HI emitter options covering cool, neutral, and warm white. I really like that Convoy have a good range of colour temperatures. Output with a 7A warm white emitter was tested to be approximately 900 lumens at 30 seconds (with freshly charge Sanyo NCR18650GA cells) based on a ceiling bounce test. Peak beam intensity is estimated to be approximately 60k cd. The cooler white versions will have slightly more output, though there is visually not much difference between 7A and 1A in terms of brightness. Cooler white beams are more visible mid-air. There is no difference in output between the more recent clear anodised C8 and C8+. The beam is typical for a thrower, with a small intense hotspot, and less bright spill beam. 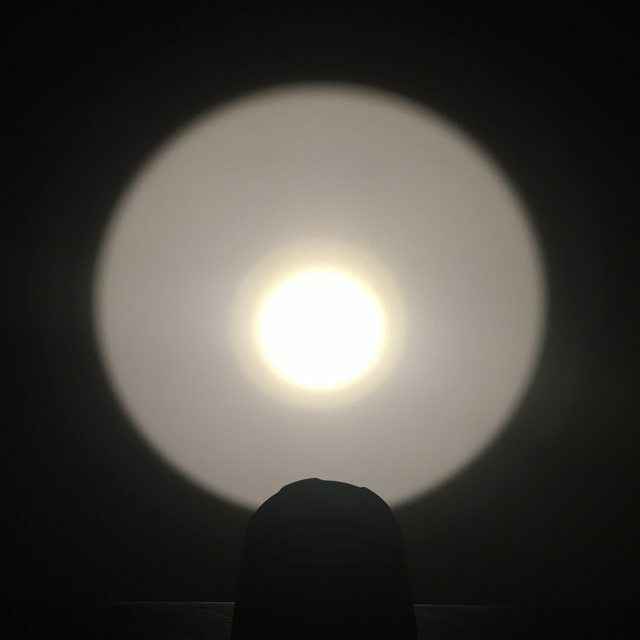 The throw certainly has a “wow” factor, and provides useful illumination well beyond 200m, and out performs most zoomy lights on zoom. Due to the use of 7135 chips, the output declines slowly as the battery voltage drops. There is no automatic step-down, which means the light can be run at maximum output until it needs to be stepped down manually due to heat. I like this lack of automatic step-down, but is does require the user to be responsible. The CRI appeares to be in the typical 70+CRI range. PWM is fast enough to not be detectable in any mode when videoing. 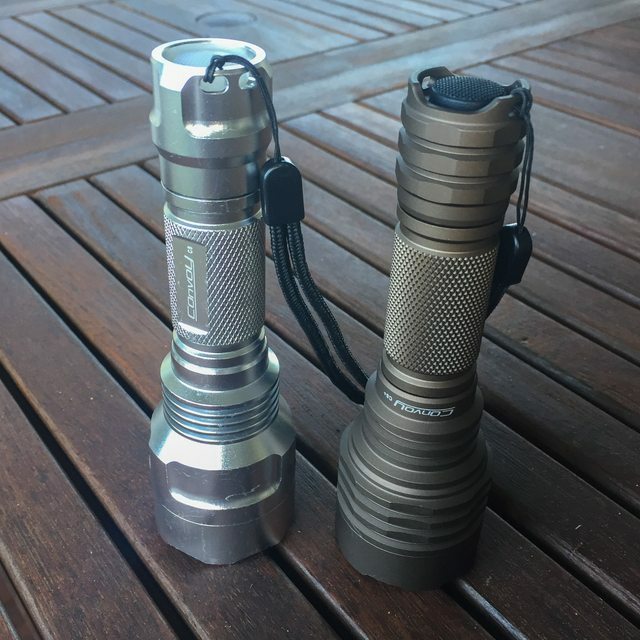 A year of so ago the Convoy C8 was almost class leading in terms of throw. However, in the last year, other budget to mid-market products have come onto the market that out perform the C8 in terms of lumens and throw. 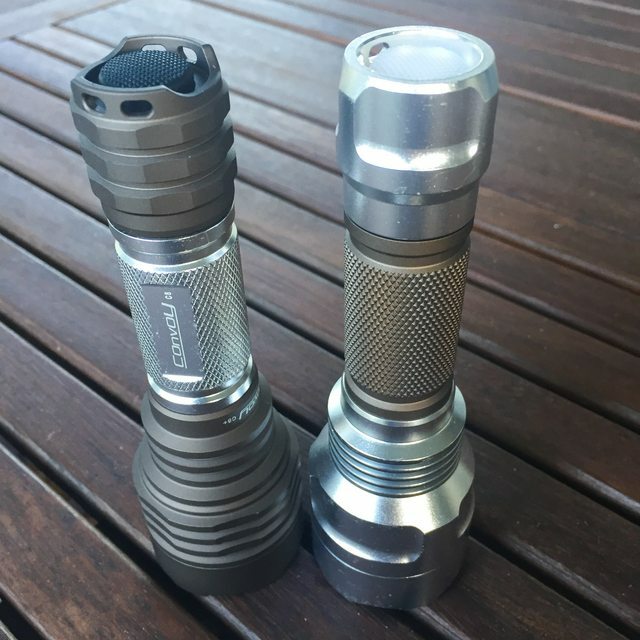 Whilst not everyone wants a trouser burning hotrod flashlight, and the C8+ still has a “wow” factor, I would like to see Convoy implement a higher output version with step-down to keep up with market trends. The Convoy C8+ gives the classic C8 a fresh new look. The great user interface, choice of tints/colour temperatures, good heat handling, and great value for money make the C8+ an excellent option for a useful throwy light. It is however no longer market leading in terms of throw and output for its class of light. 1A C8 Left, 7A C8+ Right; f/5, 4secs, ISO400. I’m perfectly okay well with Convoy not competing for the spearhead of the flashlight stat war. Let the expensive premium brands get into that bite fight. And since light painting is so niche, the two-tone strobe doesn’t bother me – heck, the light painters I know are tech-savvy enough to reflash their drivers anyway, and there’s always the 3/5 option. I order my C8+ to Simon with momentary on switch and he put it. It works fine and still flashlight can stay in candel position. 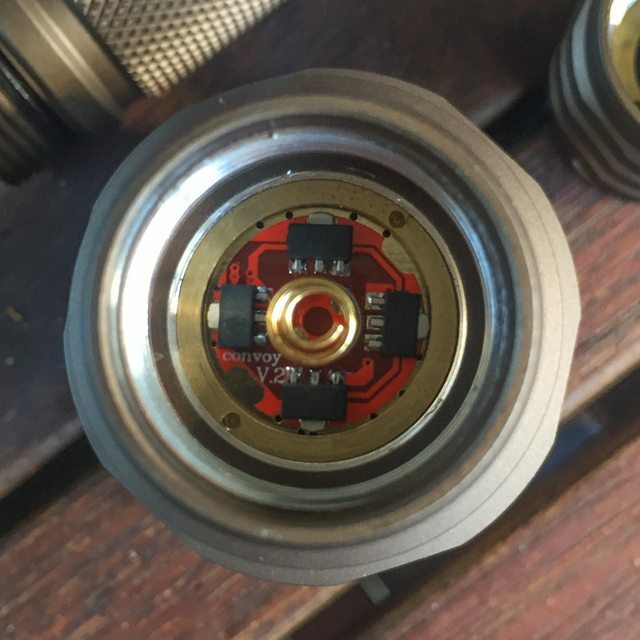 I know a lot of guys don’t like it but I’d like to see a metal switch like the s2+ has. Still didn’t stop me from ordering one. Thanks for the review Stephen. TK’s Biscotti is one of my favourites. It may lag in output compared to some but there will always be a place for a responsible light for the majority in our community. One of the best photos I have seen in a while.